The Rafflecopter prize has been announced over at All Things Dog Blog, so I guess I have clearance to let that chopper land here now too. What does that mean for you? Prizes! Tanner just took inventory of the Rafflecopter prize and he tells me there is something in that package from each of our #BarktoSchool Twitter Party sponsors: Nature's Logic pet food (they have kitty chow too), a Walk in Sync Get-a-Grip leash, a book from Peggy Frezon, and goodies from the Event Barkers team. Tanner and I will be sharing some highlights and reviews here over the next 10 days, telling your more about Peggy Frezon, Walk in Sync, and Nature's Logic. 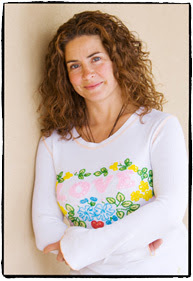 Be sure to stop in at the other host blogs to learn more. We hear that Paris will even be doing a video review of one of the products. No movie cameras for us, thank you very much. we're pretty good at posing, so we'll stick with what we're good at! If you don't see the Rafflecopter entry form below, simply click on the title to refresh and it will appear at the bottom of the post. I think it hides like that just to be stealthy. Does that impress you? We're excited to tell you that we've got the job we were made for. Big thank you's to the Nature's Logic folks from Tanner and Oliver. We get to share some of the scoop on Nature's Logic, an all-natural pet food line that makes dry, wet and even frozen food. We've got bunches of facts from our mom, but we'll also be giving you our taste bud's opinion, more important than most anything else, right? Today we're actually here to share the beginning of our PreTweet contest. That's a tongue twister for sure. Basically it just means that you can Tweet about the #BarktoSchool Twitter Party to win prizes. That's pretty neat, huh? Oops...Tanner says we have to tell you what the prize is for winning the PreTweet contest. Mom's locked up all the deets tight, but we got a quick peek and can tell you it will include a Walk in Sync Get-a-Grip leash (Tanner has one; it super duper nice), a bottle of yummy smelling Mango shampoo from Austin Rose, my fave--a box of training treats--and some Nature's Logic food, dry and canned. Wowzer; that's an awesome prize for some pet family. We'll be back soon to share more deets on the #BarktoSchool sponsors and their products. Hope to see you real soon, and don't forget to RSVP here for the party so you can win our great prizes. 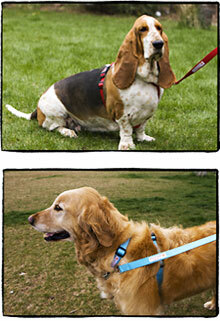 This is Alecia, the maker of my new harness and leash walking system called Walk in Sync. Mom's planning a review soon so you'll get to see me showing off my moves. Well, actually, she won't allow me to do much in the way of moves with this new system. Apparently the whole reason for it was to keep me from getting too excited when I see ducks or friends down the street or pretty much anything that gets me drooling for a fun fest. I've been biting my tongue for weeks now, just waiting to finally let the cat out of the bag. As it turns out, one of our sponsors also makes all-natural food for cats, so I guess Patches will get in on some of this action. All I have to say about that is "Woof!" Today we're officially opening the RSVP. Yup! That means you can sign up to win prizes at the party. You can also win pre-party prizes when we start the Rafflecopter and the PreTweet events, so keep your eyes open for those. 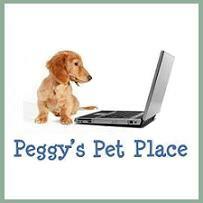 I'm going to copy mom's steps for signing up below, so you can do it here if you like. After you sign up, feel free to check out the list of sponsors. We've only got clearance to tell you a little bit and mom's locked down all the juicy info. :( What's with her? She doesn't seem to like it when we 'leak' info. That's just no fun. 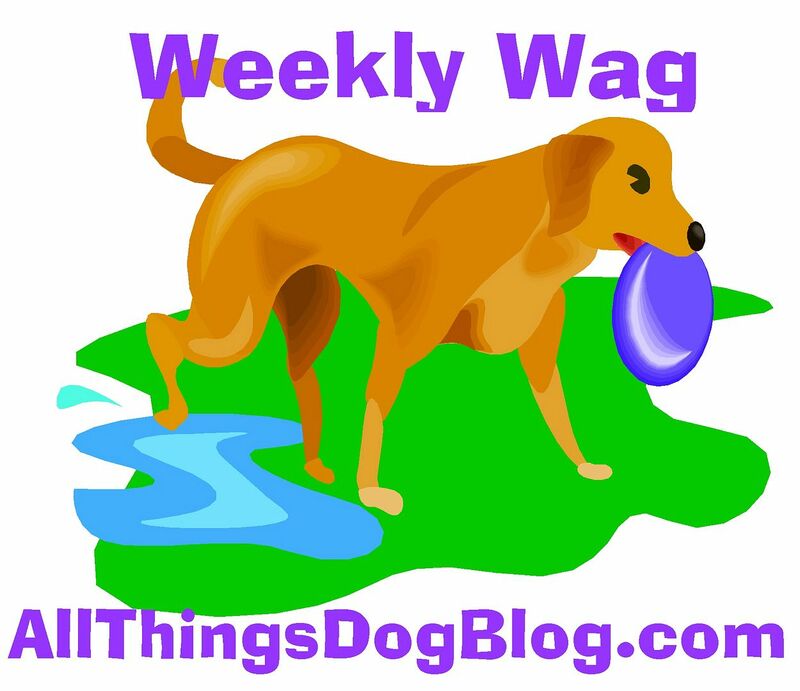 Visit her post to find out all about our blogger sponsor, our pet food sponsor, and our trainer and training system sponsor. And of course Event Barkers is getting into the mix also. You can check out this link to 'Like' them on Facebook. They seem to enjoy sharing their party info. Tanner and I like that part too. Ready to RSVP? 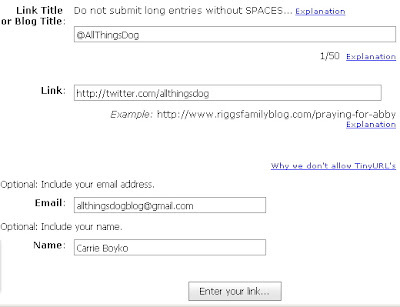 Here goes: Below the numbered list at the bottom is a blue link that says "Click here to enter". Click this and follow these instructions, using the image below as a guide. In the field that says "Link Title or Blog Title" just enter your Twitter handle with the @sign in front of it. 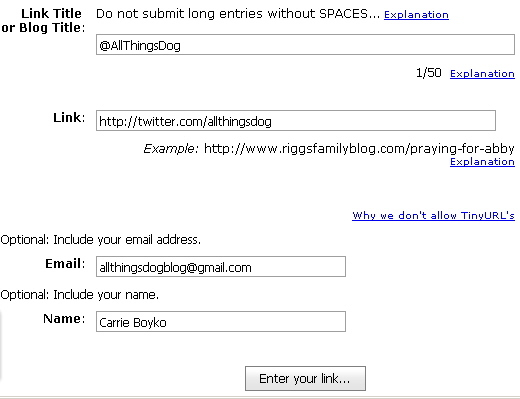 Notice mom entered @AllThingsDog in the example. In the second field that says "Link" you'll enter the link to your Twitter account. It will look like this: "http://twitter.com/yourhandlehere". You can leave your email address and name in the next two fields if you wish. This will help us reach you if your Twitter handle is listed wrong and you win a prize. Now click "Enter your link" and that's it. You have completed your RSVP. See you on August 12 at 8:00 PM ET. #BarktoSchool sponsors are providing products as prizes for our winners and working with the Event Barkers team to help you learn more about their products and services. There is no purchase required to enter or to join in the Twitter Party. Summer is almost over according to mom. Funny thing is when we look at the calendar it is still July. Isn't August part of Summer? We pow wowed and decided that mom's having a blonde moment. Apparently Paris is too. Tiki and Irie tell us that she announced a #BarktoSchool Twitter Party today, just like our mom did. Go figure! Apparently they are conspiring to send us all back to training class. Now you tell us, do we look like we need more school? There's is one upside to this. 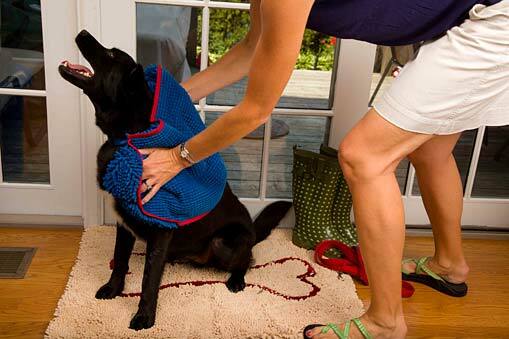 Apparently mom and some of her Event Barkers cronies are giving away cool stuff at this Twitter Party on August 12. There has not been an announcement of the sponsors yet, but we snuck a peek in the file and it appears there is food involved, as well as all sorts of other cool stuff. We're there! Hope to see you too. We'll keep you posted on future updates. This is my housemate, Oliver. You may know him already. He's the diminutive member of this household who thinks we should be all about him. Even when it comes to review products, he sometimes takes over, like today. Here's a snapshot of him annoyed with mom for interrupting his nap. Seriously?! Now let's look at this from a more useful point of view--mine. I could have used a Super Shammy to dry off from my daily swims and Fetch training. Well, that's what Mom calls it, but technically, it's just a game. After all, I've mastered Fetching 5 toys and lining them up at the back door for her. What more can she possibly want from me? After she hoses me down and rubs some conditioner on my coat, we dry off and I like to go inside and finish drying on the living room carpet. I really don't see what's wrong with that. After all, it's basically the same color as I am and I'm already all clean after my swim. I'm hardly a dirty dog except for the occasional rainy day when I decide to chase a Raccoon or Opossum around the yard. Then I get to have my paws hosed off really, really well. We're talking pedicure stuff here. I don't understand all the fuss about a little dirt. Anyway, Mom's giving away these Soggy Doggy Doormats and Super Shammies at All Things Dog Blog. If your pup needs a napping spot like Oliver, or a better way to dry off, you may want to check it out. Anybody got an idea how I can enter to win a Soggy Doggy Super Shammy? I love being toweled off. Did I mention that I love playing 'Dry the Doggy?' Ahhhhhh! It feels sooooo good.